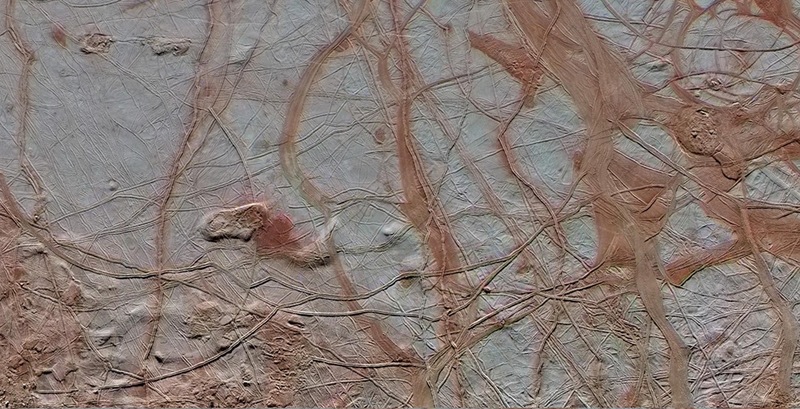 Explanation: An enhanced-colour view, this image covers a 350 by 750 kilometre swath across the surface of Jupiter's tantalizing moon Europa. The close-up combines high-resolution image data with lower resolution colour data from observations made in 1998 by the Galileo spacecraft. Smooth ice plains, long fractures, and jumbled blocks of chaos terrain are thought to hide a deep ocean of salty liquid water beneath. Though the ice-covered alien ocean world is outside the Solar System's habitable zone, new studies show the potential chemistry driving its oxygen and hydrogen production, a key indicator of the energy available for life, could produce amounts comparable in scale to planet Earth. Hydrogen would be generated by chemical reactions of the salty water in contact with the rocky ocean floor. Oxygen and other compounds that react with hydrogen would come from Europa's surface. There water ice molecules would be split apart by the intense flux of high-energy radiation from Jupiter and cycled into the Europan ocean from above.